…and because that name isn’t quite daft enough, I’m also christening it “the polish for women who don’t dig polish”. Do you think it’ll catch on? In the same way that I wouldn’t linger about ripping a bandaid off your arm hairs, I’ll also let you know that this bottle will set you back 20 of your British pounds. Did you catch that? £20. For a nail polish. Not even 15ml of nail polish. 10ml. 1). It practically applies itself. 2). It doesn’t need a top coat. 3). It was opaque in one coat. 4). It may well survive nuclear war. It’s the perfect polish for ladies who don’t normally ‘do’ nails but suddenly find themselves with the need for a nail polish that isn’t going to fail them in any way, shape or form. 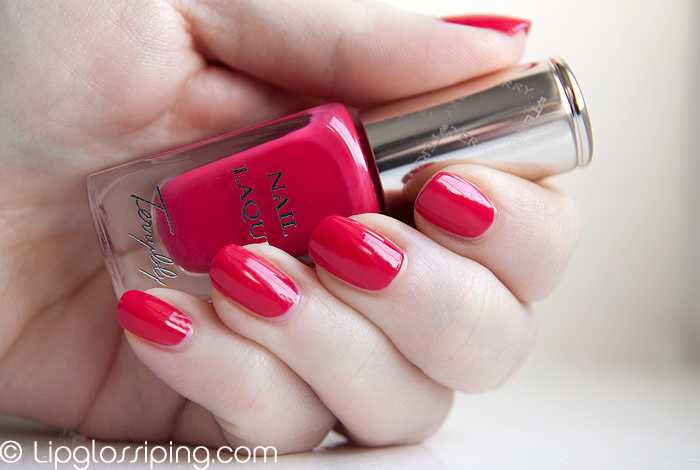 ByTerry Terrybly Nail Laque in Pink Pong is a practically perfect polish. But as a chick who digs nail polish and digs applying nail polish… I’d personally rather spend £20 on 3 bottles that give me a bit of trouble when applying, need a top coat but come in a shade that make me go ‘ooooh’! Quite frankly, I’d feel sick at myself for spending £20 on one nail polish… though perversely, I’m ok with spending £39 on a blush. Maybe I should just shut up because I’m suffering from a clear case of double-standards. Hmmmmm. I think if you need/like to wear nail polish but don’t have time to attend to it during the week, I could see this being a reasonable buy for the longevity. Also, the Terrybly (BAD name) range seems to be aimed at the more mature market – if you’re older and your nails are drier, you might be willing to pay more for the extra conditioning ingredients in this polish. I’m sceptical about the blushes, but I do think the lipsticks from the range are good. I didn’t love any of the colours enough to buy one so far though. I agree with you, it does sound like a good deal for people who don’t often wear polish but want one really good one, but I would much rather get a bunch of pretty colours. Deborah Lippman are way too pricey for my bank balance at £16 and they have amazing shades that make me drool. Well, I’m a special occasion only, OMG I must do my nails! (3 times a year?) sort of person and it sounds perfect to me. Better than the dozen or so almost unused OPI and Chanel bottles rolling around my top drawer, making me cross at the waste of money. I’m with you: I’d rather spend that money on several polishes in more interesting colors. What an awful name but the polish itself looks lovely. I have been eyeing the no.4 or 5 of these in SpaceNK as I wanted a really good classic red or orangey red. These looked promising instore so the review is helpful. I do have £5 on my ndulge card, but I am not sure yet if I will spend it on this. Your nails look so pretty and healthy. If I could get mine looking that great, I’d give up acrylics and start polishing every day! I think it looks lovely and is definitely worth the oney. You get what you pay for! £20 for a nail polish is terrible! My limit’s at £5 purely because I only care about the colour on my nails and not how it applies. Who care if it chips on the third day? I’d have long replaced it with a different colour by then! I think £39 for a blush, whilst quite indulgent, is still justifiable since it’s a FACE product. People are always going to be looking at your FACE and probably not notice your nails 8 out of 10 times, so might as well give ’em a show 😀 Plus blush quality matters terribly, and you always need the pretty compact that you can pull out at the train station and show off! Lovely, but not really unique in terms of color. No way would I pay that much for something standard. Lipstick Psychology: What does your lipstick say about YOU?